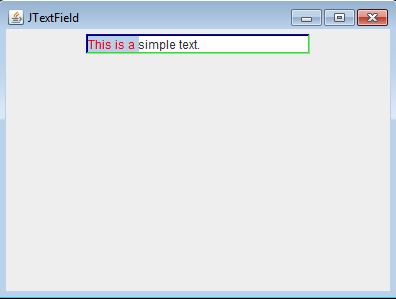 JTextField component represents a text field that you can edit a single line of text. Unlike TextField, JTextField allows you to decorate the border of the text field, and specify the color of selected text. JTextField does not support password functionality. If you want password input, you need to use the JPasswordField instead. The JTextField component can generate document events. A document event can be received by implementing the DocumentListerner interface and registering the listener by invoking the addDocumentListener(DocumentListener listener) method. The DocumentListener interface has three methods: removeUpdate(DocumentEvent e), insertUpdate(DocumentEvent e), and changedUpdate(DocumentEvent e) to be overridden. creates a text field with specified number of columns. creates a text field with text. creates a text field with text and specified number of columns. returns the text of the text field. specifies the border of the text field. selects the text in the text field from start to end positions. specifies the color of the selected part. specifies the selected text color. sets text to the text field.